The structure and visual appearance of a page are defined using wiki markup. This section describes the most widely used formatting elements. 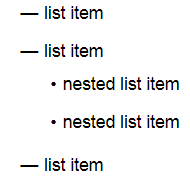 For a full list of elements, see the Markup reference. You can divide your document into sections and subsections. Each section begins with a heading and continues up to the next heading on the same level or a higher level. Tip. 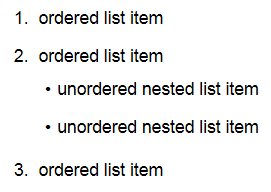 The order of numbers in the markup does not affect the final list numbering. 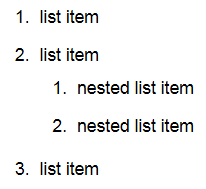 However, it is easier to work with the source text when the list elements are numbered in order. Restriction. Highlighting works properly only when there aren't any spaces between the markup and the text.